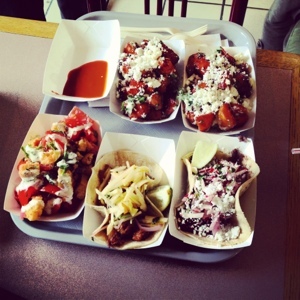 Grumman 78 - A Taco heaven? My visit to Grumman was so long ago, in fact it was at their Faubourg location that closed a while back. 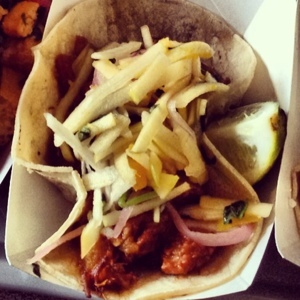 Two friends and I headed over the Grumman for what we heard were the best tacos in town. 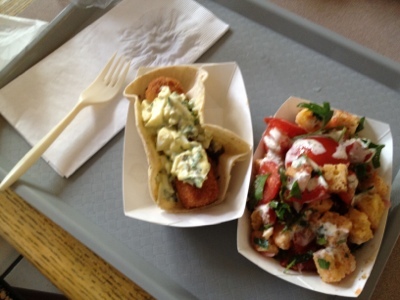 Arriving at their order counter, I quickly ordered two tacos (pork stick and the lamb curry taco), papas Grumman and a tomato and corn bread salad. 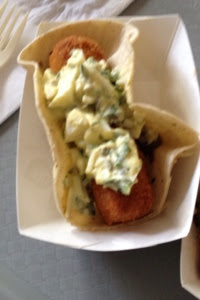 The first Taco I had was their "Pork Stick" topped with a delicious potato and egg salad. When ordering this taco I thought I would be transported into a different taste dimension, maybe I was expecting too much. It was good, but nowhere near as good as everyone made it seem. I found it to be a bit lacking in flavour, I barely tasted anything expect the salad topping. I enjoyed it but wasn't as impressed as I thought I would be. My worries quickly dissipated when I took my first bite of the papas Grumman. These delicious fried cubes of sweet potato topped with a light garlic mayo, cilantro and queso fresco are the perfect side dish to any Grumman 78's tacos. These crispy and perfectly seasoned potatoes were enjoyed by all three of us, in fact we actually ordered three orders and then a fourth - they really were that good! Next I sampled the lamb curry taco - WOW! The lamb curry was cooked and spiced perfectly - really tender, not too spicy, just really and truly delicious. The fresh julienned apples and I think mango salsa gave the taco a fresh crisp contrast to the spiced lamb curry - I had two of these bad boys. For anyone who likes lamb, you'll love this taco! 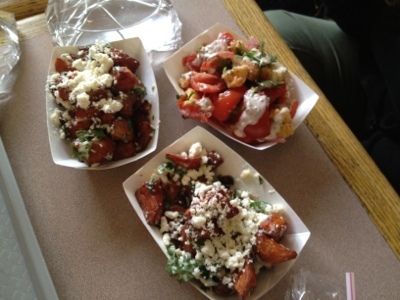 The tomato and cornbread salad was a refreshing delight and excellent side dish to the tacos. 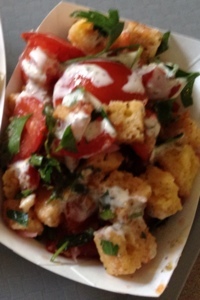 The fresh ripe tomatoes and crispy corn bread went beautifully together, especially topped with fresh cilantro and a light dressing. I really enjoyed my visit to Gurmman 78 and have heard awesome things about their headquarters and how much fun it is to have dinner there. I will have to make an excuse to schlep down there for another visit soon. Glad you enjoyed the review! You have to have the lamb curry taco - I promise it will not disappoint! I never said that Grumman was authentic Mexican, it really isn't at all! I have eaten in Mexico and at Itacate near little Italy and enjoyed both. I don't comment on pricing when reviewing a restaurant, I focus more on the food.